5 tips on how to apply flawless concealer, Neutragena Ageshield face to moisturize and protect, MAC NW or Jane Iredale spot conceal, Illamasqua Cream Foundation to even out skin tone, Becca Luminous Skin Colour for glow, Rimmel Stay Matte to set. Real Techniques core makeup brush set to apply. If you want to make your skin look instantly younger after 40, 50, or 60 then concealer should become your new best friend. The key to concealer is to break it down into several steps, find a create shade with good consistency, then cover and blend, blend, blend. Nothing can make your skin look younger like a good concealer application will. It covers flaws and blemishes making your skin a beautiful natural and uniform canvas. Good concealer application means you will need less makeup on top. This will help you look naturally younger rather than merely made up. Don’t forget, concealer can help you even out and cover the various skin tones that you see when your skin starts to age. Is your skin sallow, grey, red, ashen or yellow? Do you see broken red capilarries peeping thought? Don’t worry concealer is the perfect weapon for demolishing shoddy skin color. For porcelain perfect skin you are going to want to first moisturize. This step is crucial after you wash your face and before applying makeup. Makeup application goes 10 times better with moist soft skin as under base. Apply moisturizer to skin, preferably with SPF, and let set for a moment after gently rubbing in. This creates an under base that the concealer will adhere to perfectly. Try something like Neutrogena AgeShield Face which is a broad spectrum sunscreen with SPF 110. Next, use concealer either in stick form, thick liquid or cream form. The dryer your skin the more moist you would want your concealer to be so that it applies smoothly. MAC NW works great but there are many brands from Laura Mercier to Jane Iredale to L’Oreal at the drug store. Using finger, brush, or applicator tip, dot the concealer over all of the teeny tiny scars, pimples, cuts and blemishes on your skin. This is going to be basically spot coverage to blot these visual distractions out. When you do this, you give you skin that pure uniform tone look that younger women with perfect skin have. This will make you look instantly younger. Gently blend in the spot coverage so that you can’t see the flaws and can’t see the concealer outline on them either. A magnifying mirror can work wonders for getting your spot coverage done quickly and to perfection. If you want a smoother cream than those I mentioned, you should try Illamasqua Cream Foundation which is creamy, pale and extremely high coverage. Next, you are going to want to use concealer again but this time the purpose is to even out a different type of flaw. These flaws are discolorations across a wider swath of skin. Examples would be ruddy skin, gray skin, yellow skin, orange or red skin. These areas are very common around the creases in your face such as under eyes, around the nose to mouth lines, in the chin, between the brows on the forehead, and towards the side of your face. You are going to want to use a slightly lighter color than your skin so check for the proper shading. You can try a concealer makeup such as Compulsive Cosmetics concealer that have two really pale shades that are blendable for this. To cover bad skin color you need a very light color shade to combat it. Don’t worry because you will apply foundation or mineral powder after these areas are lightened which will tone the color right back down. If you can’t find anything to your liking at the drugstore try Compulsive Cosmetics concealers as they offer two pale shades that can be blended to perfect consistency. Now you are going to need a really top notch makeup brush such as one in the brush set Real Techniques core detailer brushes to dab the concealer onto the areas of poor skin tone and blend it in gently. A nice buffing brush should blend the oncealer in well. The result is going to natural looking, younger looking skin for you. You would be amazed at how applying a moisturizer then concealer over spots and discolored areas of your face will anti-age you! Now that everything is evened out and the flaws are covered, you are going to want to go over your face with a foundation that makes it absolutely glow. If you like liquid foundations try one in a light color and only apply a little tiny bit gently all over your face dabbing and rubbing in with fingers or a medium brush. You do not have to cake this on. A very, very light coat of moisturizing foundation over your concealer job can serve to blend it all together and set the singular tone of color. Uniform, even color is a sign of youth and this is going to give you the illusion of that all over flawless model skin tone. For a flawless cover try Becca Luminous Skin Colour in Porcelain which is a tinted foundation/moisturizer with antioxidants A, B, D and E.
Next, you can use a mineral powder makeup in a natural light tone with a large application brush to set the result. Use two brushes one that covers entire face and one that can get nicely into areas like the eye wells under your brows and between your nose. For a less expensive choice try Rimmel Stay Matte in transparent or use a mineral based powder such as Bare Minerals. Keep the coverage light so that the dewy look of your skin from Step 4 remains. A little goes a long way and you want to avoid looking cakey. These simple steps of moisturizer, spot conceal, even out discoloration, apply glowing light liquid foundation, and finally pressed or mineral powder, works. Your skin is going to look so beautiful and natural, not to mention … absolutely perfect! 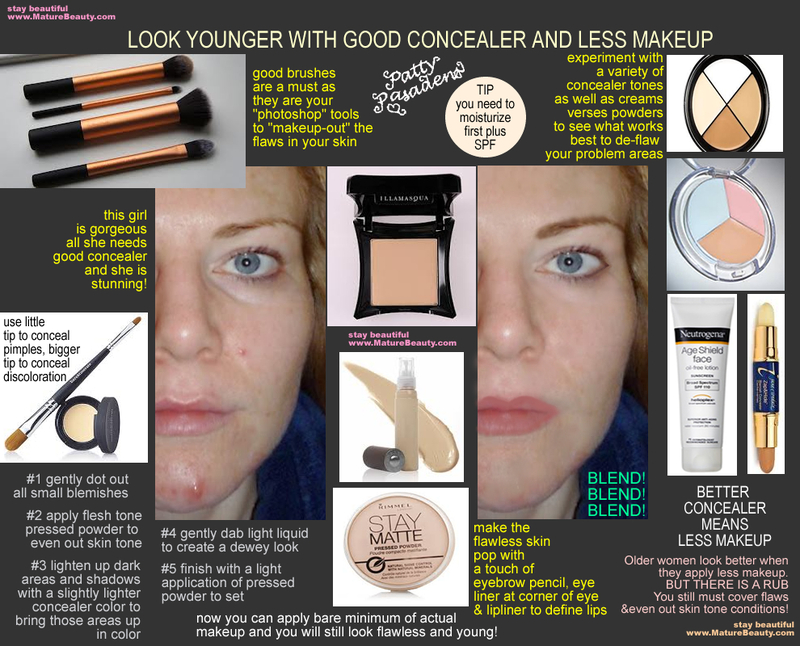 If you are over 40 invest this time on the 5 concealer steps and I promise you will look younger. Trust me this will enable you to wear less makeup overall and you will look incredible. Good concealer techniques take 10 years off your face easily. Not only that, you can apply far less makeup on a good base. Get that natural beauty look really going on. Good luck!